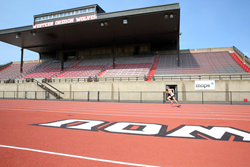 Hellas Construction renovated the 10 year old running track at Western Oregon University this summer with their epiQ TRACKS® X1000 Re-Top. Two months after completion, the university continues to speak highly of the sports construction company for their professional work and the high performance of their product considering the difficulty of the project in terms of installation and engineering. Hellas Construction was great to work with. They had a really professional crew on-site. The project was a challenge due to different patched surfaces from previous installations. Hellas’ expertise on how to carefully prepare and seamlessly merge the previous surfaces together - creating a solid subsurface, and then fusing it to a new epiQ Tracks X1000 Performance Re-Top - is what makes this a unique running track installation. “Hellas Construction was great to work with. They had a really professional crew on-site. You really felt that you were working with professionals,” said Mike Johnson, WOU Track and Field Head Coach and member of the NCAA Division II Track and Field Committee. Now the nearly $300,000 project showcases an 8 lane running track of eco-friendly, non-petroleum based materials that offers athletes superior performance, high control, better cushioning, and energy return. “The running track is responsive and the athletes enjoy working with it,” Coach Johnson said about the new surface. The same product was used for the facility’s field events areas, including high jump, pole vault, javelin, steeplechase, and more. Hellas voluntarily surfaced the field events area inside of the track to ensure the facility was fully optimized. The WOU Wolves are scheduled to host the NCAA West Regional Cross Country Championship in November 2015 and the GNAC Outdoor Championships in May 2016. Please click here to watch Hellas Construction's full Western Oregon University testimonial. Headquartered in Austin, Texas, Hellas Construction is a nationwide contractor with a strong reputation for delivering premium-quality sports construction projects across the United States. Hellas has the ability to custom-manufacture and install its own synthetic surfaces for field sports, running tracks, and tennis courts, by controlling all related operations. For more information, visit hellasconstruction.com or follow them on Twitter and Facebook. Western Oregon University is a public liberal arts college located in Monmouth, Oregon. It was originally established in 1856 by Oregon pioneers as “Monmouth University.” WOU has a student body of approximately 6200 undergraduates and 400 graduates. To learn more about WOU please visit http://www.wou.edu.